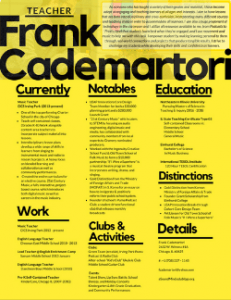 My name is Frank Cademartori and I consider myself an educator first and music teacher second. I think most teachers would agree with this sentiment since we don’t get involved in this field for the love of subject material, but rather the love of learning. 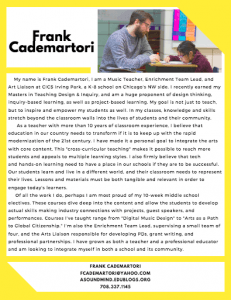 My name is Frank Cademartori, I am a teacher, Enrichment Team Lead, and the Art Liaison at a K-8 charter school on Chicago’s NW side. I also serve as the Enrichment Coordinator for the entire charter network. 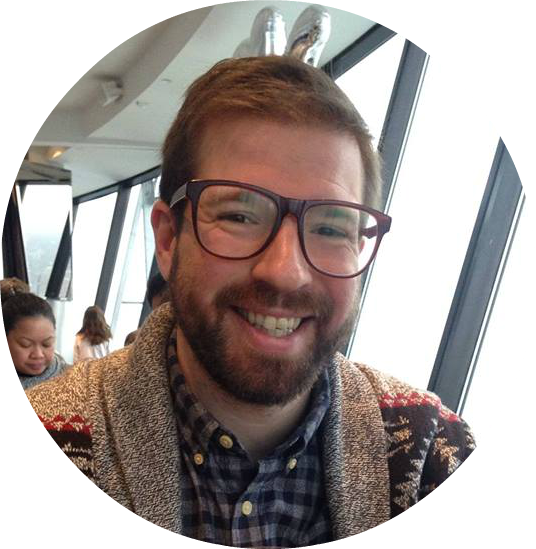 I recently earned my Masters in Teaching Design & Inquiry, and am a huge proponent of design thinking, inquiry-based learning, as well as project-based learning. Additionally, I am a K-9 certified teacher (Type 03) with Social Studies, Middle School, & Business endorsements. My goal as an educator is not just to teach, but to inspire and empower others as well. I’ve always worked to make the knowledge and skills we learn stretch beyond the classroom walls into the lives of my students and their community. I always try and live my vision when planning, teaching and developing curriculum, with the aim to invigorate not just my students, classroom, or school but to change the way we approach the field of education. My school was part of the 2nd cohort of the LEAP Breakthrough Schools Grant, and I was privileged enough to be a member of the very small team that oversaw and implemented this process. We worked on redesigning not only the classroom but educational instruction as whole. Focusing on three main pillars, Community, Personalization, and High Standards we totally reworked our 3rd and 4th grades with wonderful results. I mention this because not only am I proud of it but also to illuminate the fact that our admin supports us and encourages us to think outside the box and be innovative in our approach to learning. I think as you look through my posts you’ll see that reflected in a lot my lessons; which, more often than not, are more than just music. Additionally, I’ve worked with a number of wonderful institutions and formed many partnerships including, Old Town School of Folk Music, Littlebits, Google AR, Crossing Borders Music and more. I love honing my craft by attending PDs such as the Harvard Business School’s NAATE, and when I’m able I share the work I do as a presenter. I’ve presented at Ingenuity’s Arts Education Conference, LEAP’s InnovatED Summit, and work closely with CPSArts as an Arts Instruction Specialist. I hope that whether you are a teacher (music or otherwise), a parent, or just a learner in general; that you find my blog insightful and my resources useful. I know not everyone has a musical affinity, but everyone loves music. My goal is to bring that love to as many places as possible!